Strawberries are in season here in Minnesota so, I knew I wanted to use them my Fourth of July dessert. Since I had a lot of things to cook that day, it had to be pretty simple dessert. This pie was just the ticket, easy and quick to make plus fresh and cool for a hot summer night. The only thing baked here is the crust which, ok shoot me, I bought at the store. The base is made just by whipping together cream cheese and mascarpone with vanilla, sugar and lemon juice (oh, that lemon juice really brightens the whole thing). Then it's just a matter of adding some sliced strawberries and a little melted jam. It firms up a bit with chilling but remains really creamy. I can't believe how much it tasted like a cheese cake without the baking, water bath or worrying about cracking. This is one we'll have all summer with different fruits as they come into season. I used a store bought pastry pie shell for this pie, it would also be fantastic with a graham cracker or shortbread crust. Cook your pie shell according to directions. Let cool. Whip the cream cheese, marscarpone, vanilla, heavy cream, sugar and lemon juice together until blended and light. Spoon into the cooled crust and spread into an even layer. Let chill in the refrigerator for about 30 minutes. 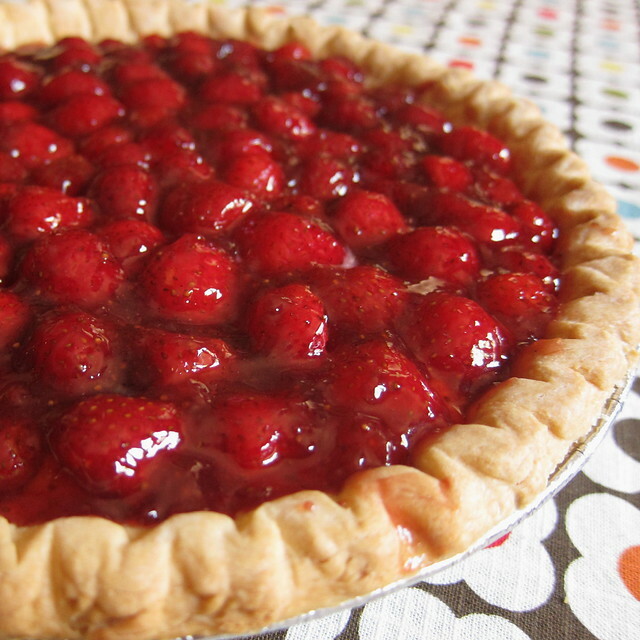 Top the chilled pie with halved strawberries. Put the jam into a small microwavable bowl. Microwave until the jam in warmed and slightly liquid, about 30 seconds. Brush all over the top of the berries letting it fill in the spaces between berries. Chill for at least another hour before serving. We actually thought it was better after being in the fridge overnight. I really have to make one of these! It looks amazing! That's a lovely pie! Really like the combo of mascarpone and cream cheese! isn't mascarpone cheese the best? i love using it in pies. Oh wow, that looks seriously delish. I would eat that filling straight out of a bowl! When the weather is hot- I am also guilty of buying prebaked crusts. I hate turning on my oven in the summer. I avoid it at all cost. Yum! We actually just picked a big bowl of strawberries and I was trying to figure out what to do with them! Bet the marscapone and lemon juice really add a lot of flavor. We have lots of berries around...we'll have to try this! Oooo, I love minimal bake desserts! I made this for work today with Crave Brothers mascarpone. It was delicious! Thank you for posting and for being from MN. Go Gophers! Oh my gosh, this looks fabulous, Kathy! I love that it's like cheesecake without all of the cheesecake headaches. Love! This sounds AMAZING. 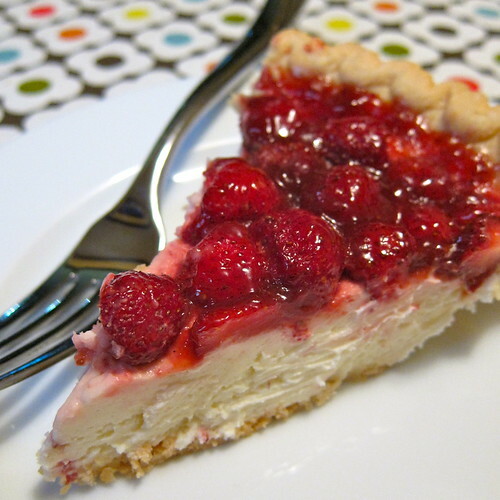 I love the idea of cream cheese and mascarpone whipped together for the filling. Mmmmm.